The country of the pointed firs, and other stories. 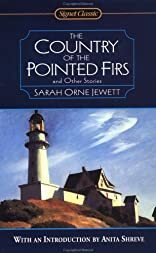 In 1896, at the age of forty-seven, Sarah Orne Jewett published this classic novel of a female writer looking for seclusion and inspiration in the coastal town of Dunnet Landing, Maine. Returning to the women and men of small New England towns for the accompanying collection of short fiction, this remarkable volume weaves a colorful and moving tapestry of the grand complexities, joys, and beauties of life. About Anita Shreve (Introduction) : Anita Shreve is a published author of children's books and young adult books. Some of the published credits of Anita Shreve include Sea Glass (Unabridged), A Wedding in December: A Novel (Unabridged).